GingerMelon's New Pocket Poppet Doll Pattern! 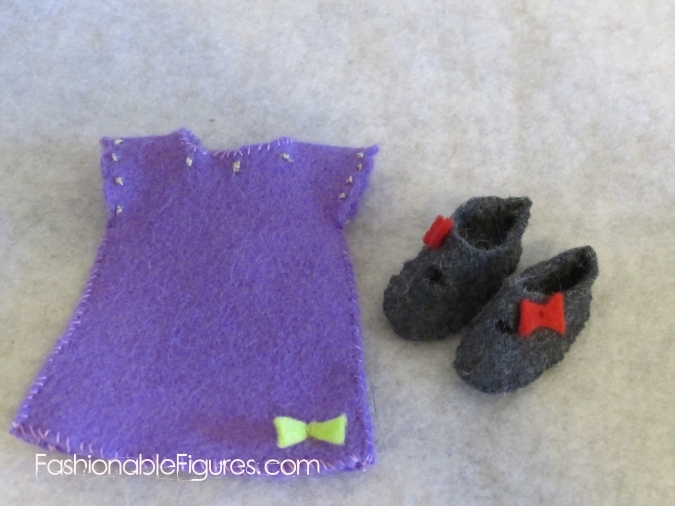 I recently purchased Ginger Melon's latest doll pattern, the Pocket Poppet doll. This doll is roughly eight inches tall when completed, and has a new "flat foot" design. Once again, the pattern drafting is very well done, and the instructions easy to follow. She has even provided a helpful diagram for placing the facial features (which is something I struggle at on every single doll). I love the new foot design, and am contemplating fiddling with the pattern slightly to allow me to insert a folded pipe cleaner in the doll's torso and legs, and see if she can stand on her own. The way the head fits onto the body works well, too, with little fuss to get the head to stop wobbling on the neck. 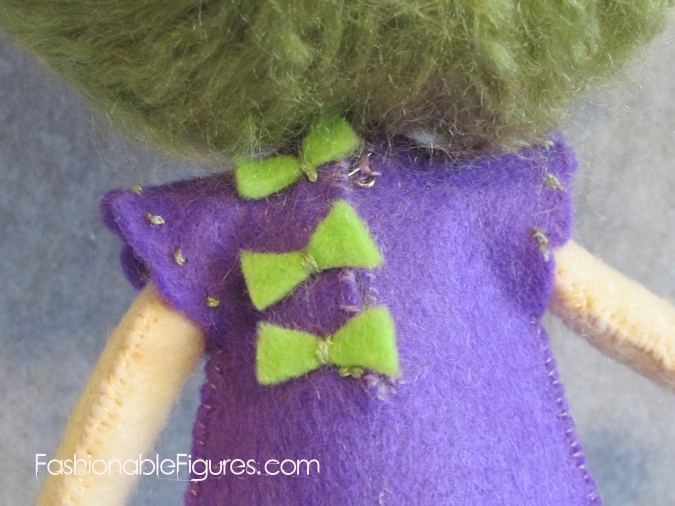 The pattern calls for you to needle felt yarn onto the doll's head. I may use Tussah silk on a future doll, but for this first one I went to an old standby I used to use for doll hair: Lion's Brand Homespun yarn. It's soft, and has little less mess to it when using it for doll hair. The Tussah silk, while lovely, gets everywhere! I cut lengths of the yarn, but before I felt it (or sew it, depending on the doll) to the scalp, I remove the two or three strands of string that hold the ply together. Once those are removed, the yarn fluffs up almost like mohair, and is soft and luxurious to the touch. I went for the sun dress with scalloped sleeves for this first doll. The pattern calls for a hook and eye closure at the back, which is something that I again struggle with each doll to get right. I typcially end up with the hook part showing. To work around this, I added some felt bows along the back for decoration. The shoe style whips up nice and quick, mimicking a sandal without needing to fiddle and fuss with a tiny strap. You need to have 7-7.5 mm safety eyes to complete the doll's look. Everything else is hand embroidered/hand sewn detailing. I like how this first one turned out, and am eager to sew up several more right away. There are lots of outfit choices to try out, too, including a cute Bohemian-inspired outfit, and a giant, floppy hat. This new doll is available for purchase on eBay. Older PostNew Binky Boos and Cotton Candy Dolls!